The 9th Homeschooling Carnival is hosted at Why Homeschool, organised around a presentation of the muses of ancient Greek mythology. Erato the "Lovely" is the muse of love poetry and mimicry. 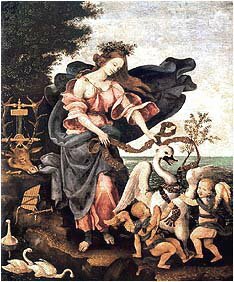 She is seen with a lyre and sometimes wears a crown of roses. 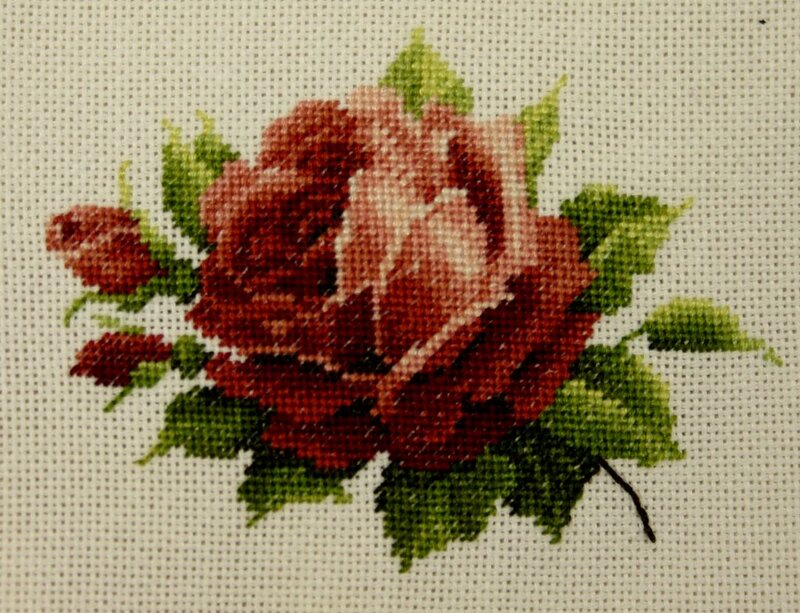 To show mimicry our post of Rose's Cross Stitching has been included in the carnival. Pop over and savour the variety of articles. Now I won't get wet!The ground around here is very absorbent. Less than an hour after yesterday's heavy rain downpour of 60mm (2.4 inches), the ground was dry and puddles only remained on hardened ground. By this morning, only the lane and roadways had puddles. And, wonderfully, lots of water is in our watertanks. 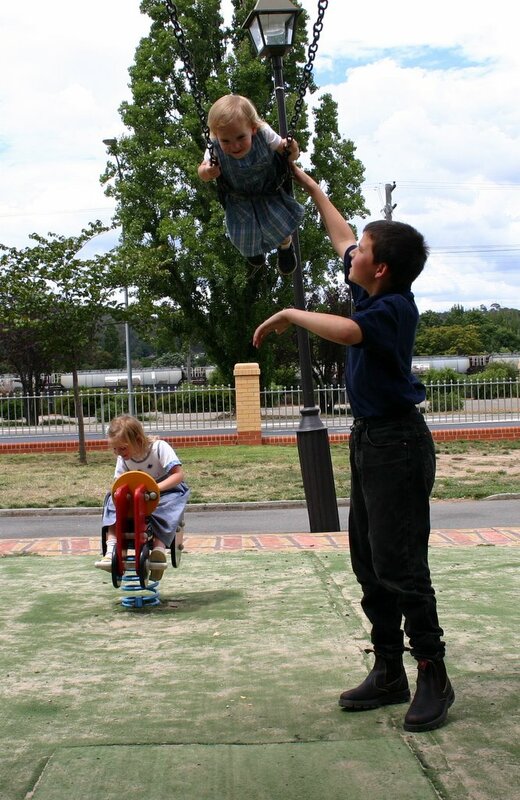 We have an old plastic playground salvaged from a fast food restaurant which had upgraded to new equipment. The bits and pieces had been passed from one family to another unassembled as no one had enough room or enough children to justify the construction. After we built the huge thing, we had some of the windows left as spare parts. The children had fun yesterday using them as see-through space helmets, boats, mini swimming pools and windows. Eric said the water pressure was pretty strong when he held up his shield. 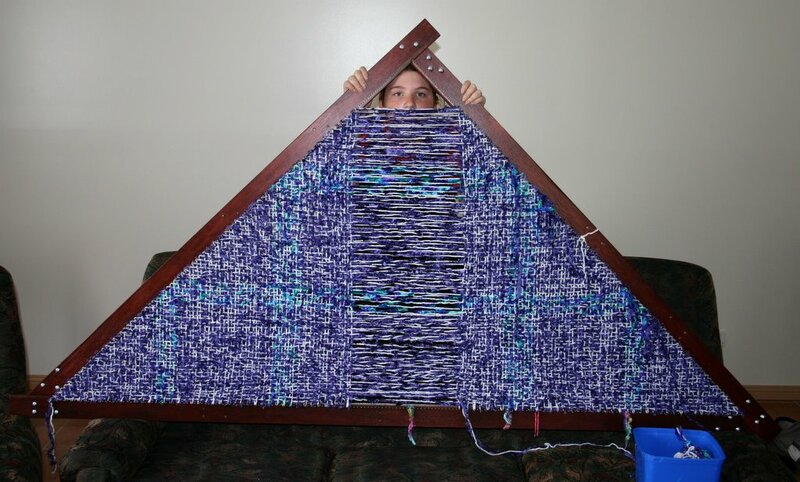 Peeking through the Shawl in progressWe first encountered Triloom weaving in the US from another homeschooling family. To experiment whilst we were there Lana banged together a triangle with spare bits of wood left over from the headboard/bed heads we had built. 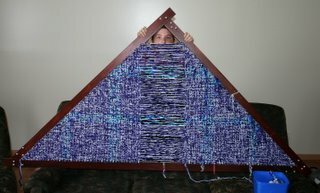 The Loom has nails along each side of a Isosceles Right Triangle. Wool is woven from the end nail of the hypotenuse (the long side) across to the other end of the hypotenuse and then around the first nail of the short side and back across to the first nail on the other short side. Then weave down to the next nail on the hypotenuse. Repeat. Wayne Schmidt's This and That site explains the method in more detail with pictures. 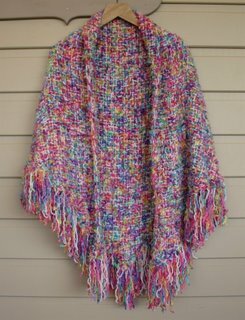 Lana's soft, colourful and warm shawl.Lana's dad made the Tri Loom Ariel is peeking through as a Christmas present for Ariel. It is adjustable and beautifully made. 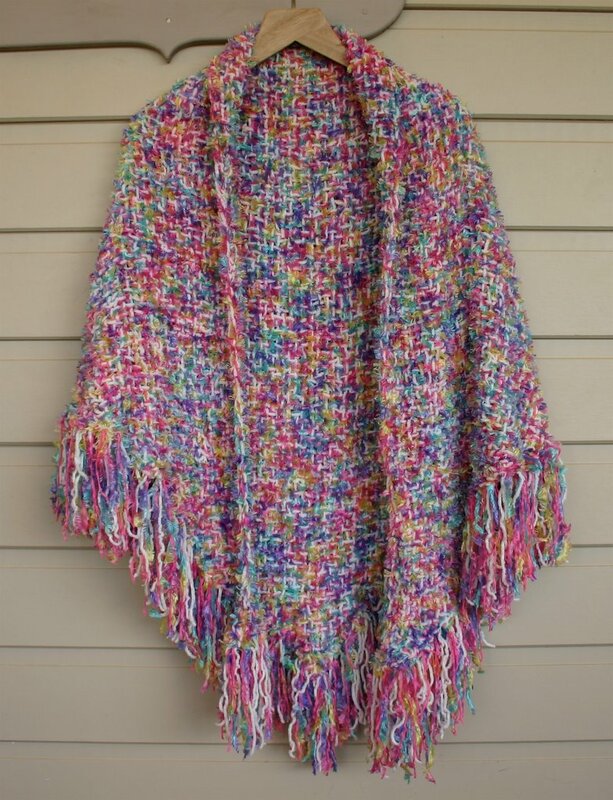 Lana made the shawl shown here using every second nail so it would be a bit more open using fluffy wool making it "nice and soft, mmmm". 4. It's different. I like doing something new and crafty. 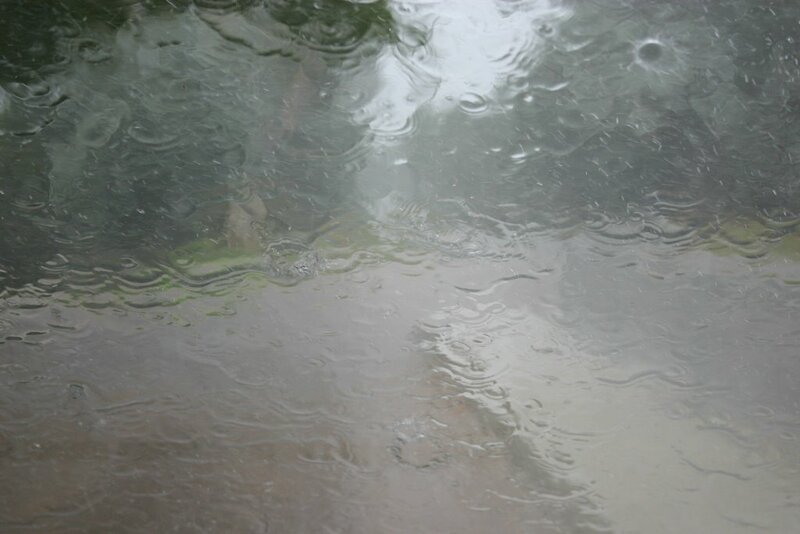 The view from the driver's seat.On our way home it rained quite heavily and we were forced to stop as we couldn't see the road. Once it slowed down we returned home. The sky cleared, the sun shone, we looked outside and the clouds promptly rained bucketloads more. 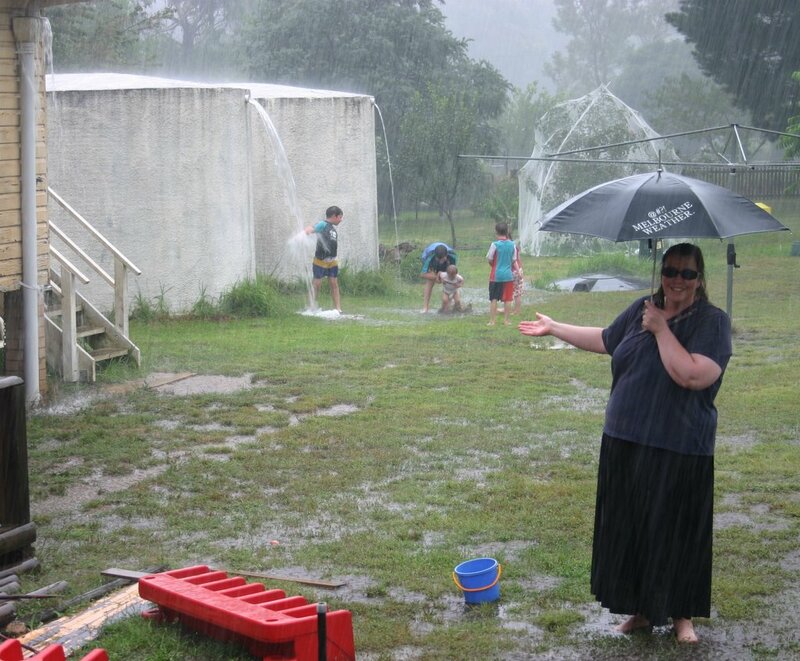 All of our water tanks overflowed and the children wanted to play outside. "Why not?" we said and out they went to play. 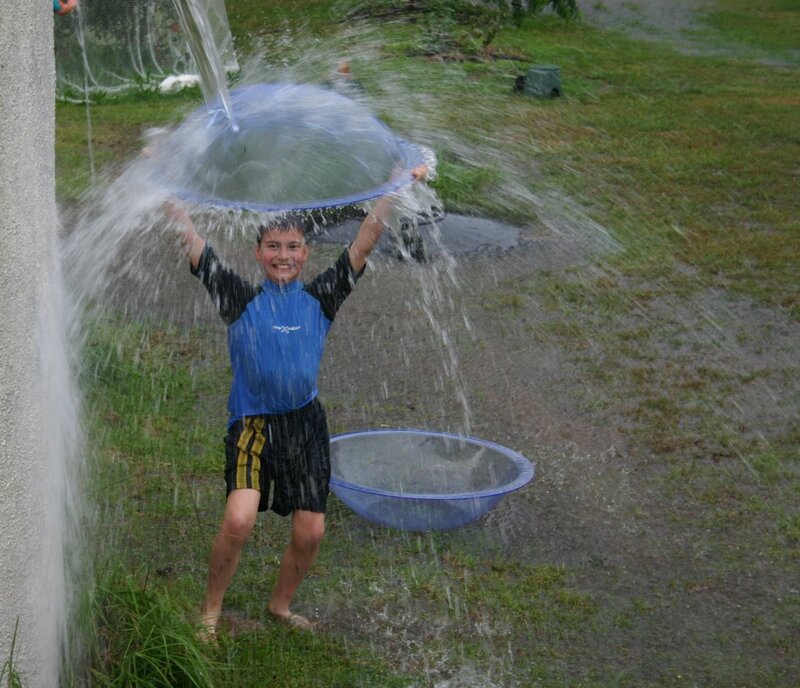 Playing in the rain is great fun! Puddles quickly grow into streams, getting dirty is no problem as you are effectively in the shower anyway, the water pouring out of the rainwater tanks is fun and with buckets and other implements you can conduct scientific experiments. Is it raining yet?Lana went out to check whether it was raining. Her umbrella is one we bought when we lived in Melbourne, a city famed for its variable weather. Lana's Dad told us that we MUST water the lettuces no matter how much it rains as they need to be watered every day. I don't think we will be in too much trouble when we had over 50mm (2 inches) in under an hour. But the children did check with us. They didn't want to let down Opa. After Mass today we spent an enjoyable afternoon at a nearby park. 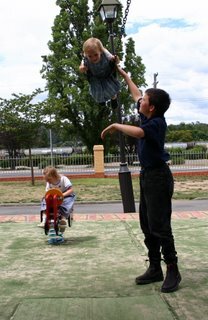 There are many different pieces of equipment on which to play and the children enjoy playing on them together. 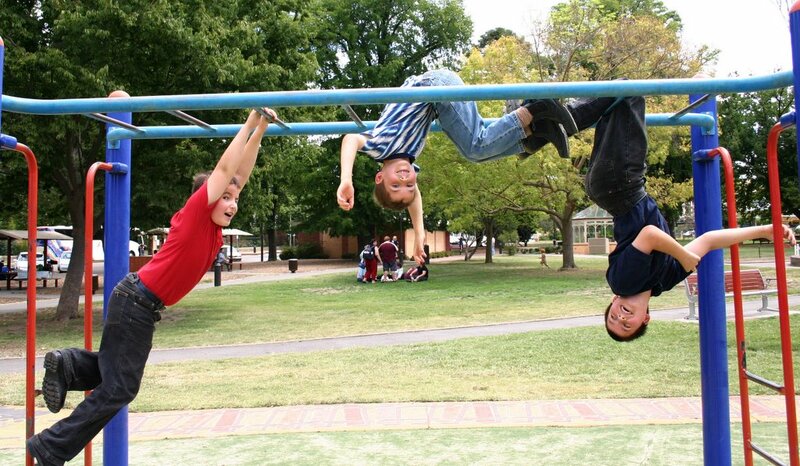 In this photo all three boys wanted to show how they use the monkey bars. At another time Eric pushed Rose on the swing, James and Peter helped Clare on the slides or swings, and they all played on the train playset. Only one thing bothered them. Higher! Higher!A mother beckoned to her young boy (3 or 4 years old) to come with her as they were leaving. He wouldn't go. She tried the "I'm leaving" thing and started walking away. He whined and did his tantrum. Once she was out of sight (in the public rest rooms) he went back to playing. A couple of our children suggested to him that he should go to his Mum. He looked at them strangely. Then his Mum started walking back and beckoned to him again. He beckoned back to her then went onto another piece of equipment. So she had to return. He still refused to obey and she let him "have just one more go". Then he still refused until she had no choice but to pull him off. He screamed, so she let him have "just one more go". Then she finally gave up being "nice" and grabbed him under her arm with him screaming all the way. A short time later I called the children, "Come on. Let's go! ", and they all came and we went. So much for today's socialisation. Dave Ramsey has a lot of valuable information on getting rid of your debts. He must be right because we both agree on so many things! He has a great series of confessions by people who have done very silly things relating to finance he calls "Stupid Tax". He describes many techniques that can be used. I always recommend the books The Richest Man in Babylon and The Millionaire Next Door . The combined cost at Amazon is less that $20 (US) and these two books describe in very simple terms the basics of financial security. If you want your children to learn how to use finance and credit wisely, you must start with yourself. Read the Stupid Tax stories. They are great examples of dumb things to avoid. Tonight we had a movie night at home. Some fish, corn chips, cheese, tomatoes and other yummy things whilst watching the BBC version of Shakespeare's "A Midsummer Night's Dream". The play is about misplaced loves, jealous lovers and mischief making fairies all getting confused within the forest on a midsummer's night. We are continuing to enjoy Shakespeare. 5. We are not analysing them to death. Nice and pretty changing to spiky and bulbous. 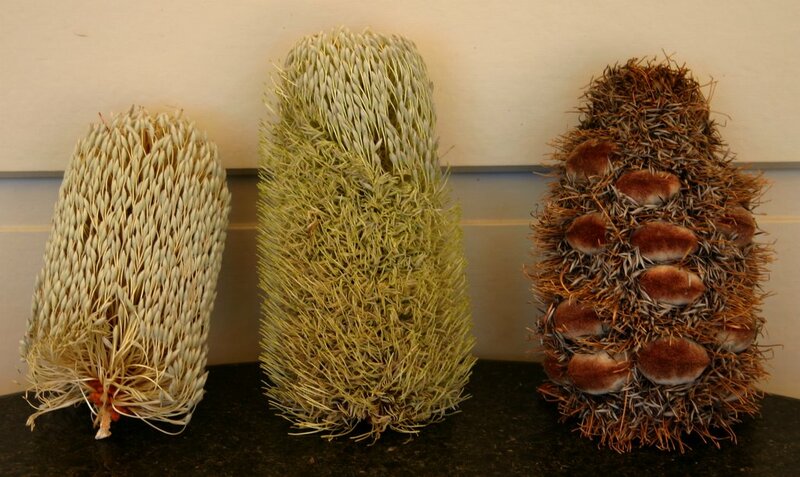 On a recent bushwalk, Eric and Lana's parents found some of these Banksia Tree flowers/seeds. From left to right you can see the stages of the banksia tree from flower, losing some flower fronds, and the growth of the banksia seeds themselves. May Gibbs is a well known Australian author of children's books and the shape and colour of the end product inspired her to think of the Big Bad Banksia Men - the "pursuers and persecutors of the Gumnut Babies"
For a good description of Banksia Trees (and the Big Bad Banksia Men), go to answers.com. That's going into the Treasure Table! Our successful blackberry excursion has meant lots of yummy Blackberry recipes. 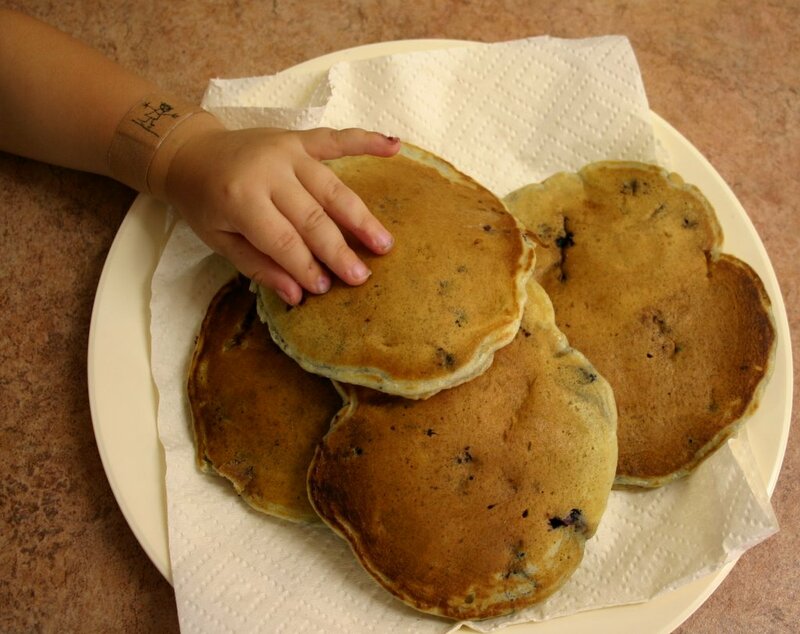 Today we had Banana and Blackberry pikelets. As always, we make double the mixture. Mix vinegar in milk. Add to mixture. Then melted butter and sliced banana (and other fruit). Stand for 30 mins before cooking. Cook the same way as pancakes. Options: Use grated apple, or leave out the blackberries. Today Lana and James were reading about spiders, moulting and exoskeletons. Peter was nearby listening too. Then not long afterwards they found this. 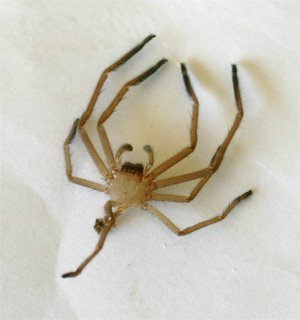 This is only a baby huntsman spider with legs between 25 and 35 mm (1 - 1.5 inches) long. Update: Lana just found an even bigger exoskeleton. The legs were 50mm (2 inches) long. After checking her heart rate, Lana brought the bigger one in and it's now in the Treasure table. Time to heal. 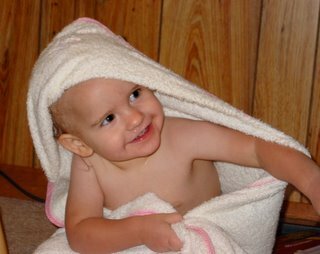 When our children are little, they can't stop themselves picking away at a sore, especially if it is in a spot they often notice. 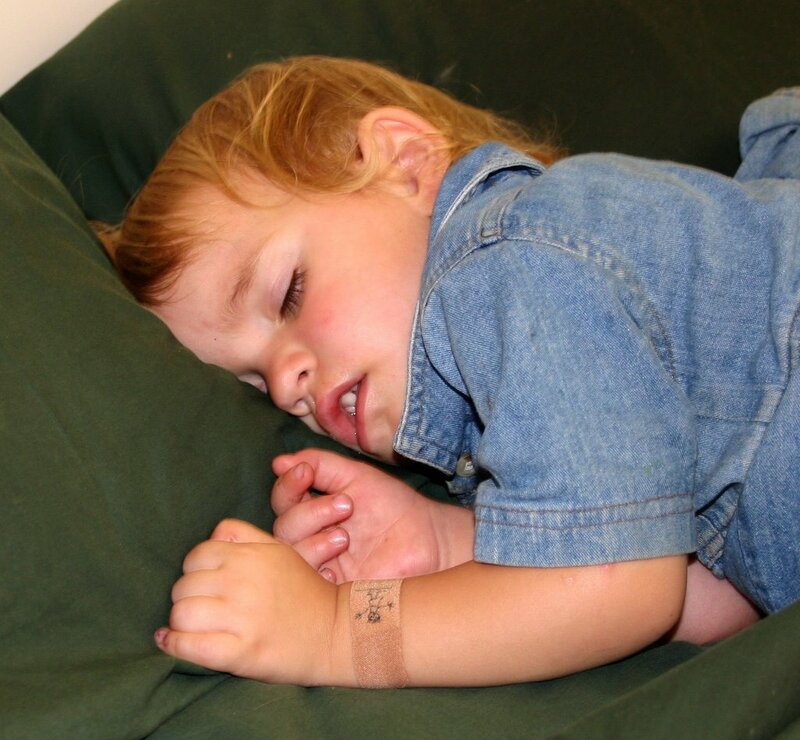 Rose had a mosquito bite on her wrist which wasn't much of a problem. Unfortunately, as she keeps picking, it is now a sore that doesn't have the chance to heal. Lana tried a bandaid, but Rose pulled that off too. Now her body should have time to heal the sore properly. Boo! Don't play with the torch! What do you do when the power goes out? Sometimes it is just for a few moments but other times it can be for hours or, worse yet, days! Being out of town, we use rainwater and the power tends to fluctuate too. So here is what we do to handle black-outs. 1. Check that you haven't tripped the power yourself. If not, call the power company. If everyone assumes someone else will call, the power company may take a while to realise the power is out. 2. UPS - Uninterruptible Power Supply. Computers need a regular supply of power to operate and to maintain data integrity. Often power straight from the socket can fluctuate enough to cause damage to hard disks and cause greater wear on compnents. A UPS not only regulates the power to within safe limits above and below the standard, it also acts as a surge protector (in case of lightning strikes, etc) and the battery backup allows you to safely close down the computer. This has saved our data and files many times. 3. A non cordless phone. Cordless phones do not work without power. We have an older phone in the cupboard for use in blackouts, and the cordless phone base station is plugged into the battery backup part of the UPS. 5. Cooking options. We have gas and electric cooking and a gas barbeque. That way we will be able to prepare hot food without power. 6. Water. Being outside town our water is derived from rainwater tanks. In the US we had a well. Either way, once power was off we couldn't use the faucets, or flush the toilets. We have ensured that we can get water directly from the tanks without power using a gravity feed faucet. At least that way we can flush using a bucket. 7. Minimise opening the fridge and freezer. The cool cannot be replaced without power. 8. Rediscover non electronic entertainment. This is the most fun part. The reason we have posted this today is because our power went out for a few hours. I was working from home and was able to save my data in progress because my desktop had battery backup and the laptop had its own power. Once I had saved my documents and shutdown the desktop, I worked on the laptop whilst it battery lasted. Then it was filing and cleaning up. Then the power came on. !! The power just failed whilst I was writing this post!! As the post is in blogger and the internet went down with the power, I saved all that I had typed by copying the test to notepad - from the "Edit HTML" tab. Then before the battery died I quit all the programs and shut down. Unfortunately. the power came back on and then failed about 10 minutes later and again it did the same. This meant the battery backup had run out and the computer crashed twice. Something on the hard disk failed and it wouldn't start up. To fix? I tried starting in safe mode but it didn't get that far. So I booted with the Windows XP setup disk and entered recovery mode and ran CHKDSK /F. This found the bad sectors and fixed them allowing a normal reboot and all was well. In our previous Sudoku post, Michael of Family School helpfully pointed out the Sudoku pages by Krazy Dad. Krazy Dad has some marvellous puzzles available free of charge as well as some very useful information on solution strategies. Now, hopefully that should satisfy the Sudoku urge around here! 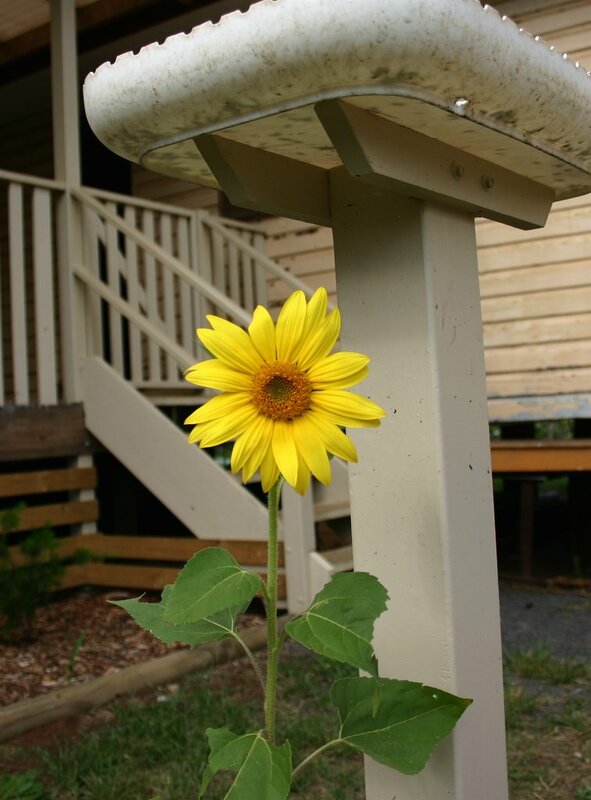 We have two young plants growing near the front gate that have greatly enjoyed the tender loving care given them by Lana's parents. Today one showed it's appreciation by exploding in blossom, just to show what we can expect when the bush grows much larger. This is an Australian Native Hibiscus. We have a loyal following of local birds partaking in the daily feast of seeds laid out for them by the children. Sometimes a seed escapes and luck is on it's side, allowing it to germinate. 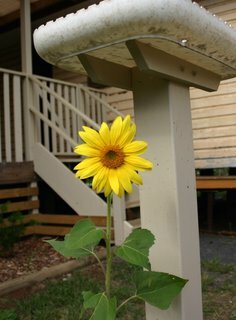 Sheltered from the worst of the weather by the bird feed tray in which the seed was originally placed, the sunflower gradually grew with many eager eyes watching and waiting. Today it came out in full glory. We will make it easier for more seeds by actually providing some better soil and a bit of a garden around the base. I suppose we could even water it too! Then we may have even more flowers. What's in your hand, Rose? Nothing! Today Lana, her Mum, Ariel and her friend all went to Sydney to a Stitches and Craft show leaving me to mind the fort with the rest of the family. So what does a Dad do on his own? We started by going to the Monastery for Mass and Benediction, where the boys served and I kept Clare and Rose in line. This was followed with me "shouting" (Aust. for paying on behalf of someone else) ice creams for us all. Then we played a Wild West Wargame. Clare and Peter were joint winners with Eric, James and I casualties and Rose enjoying some potato chips. Near our home are a number of blackberry bushes the local council is too slack to poison, so we went blackberry picking. Actually all of us picked and Rose ate blackberries. The best thing about berry picking is the end result - Berry Cobbler and ice cream. This is one of the first, and yummiest, recipes we learned during our stay in the US. Rose really enjoys her blackberries. As you can see in the photo all of the children had their share but Rose dives in with full handfuls. These muffins are very yummy. Based on a recipe by Australian Dairy Corporation ruthlessly experimented with by Lana's Mum. Bake at 180C to 200C (350F to 400F) for 25 to 30 minutes until golden brown. The end result should be of a bouncy consistency and taste really nice either warm or cold. Can be frozen, too. 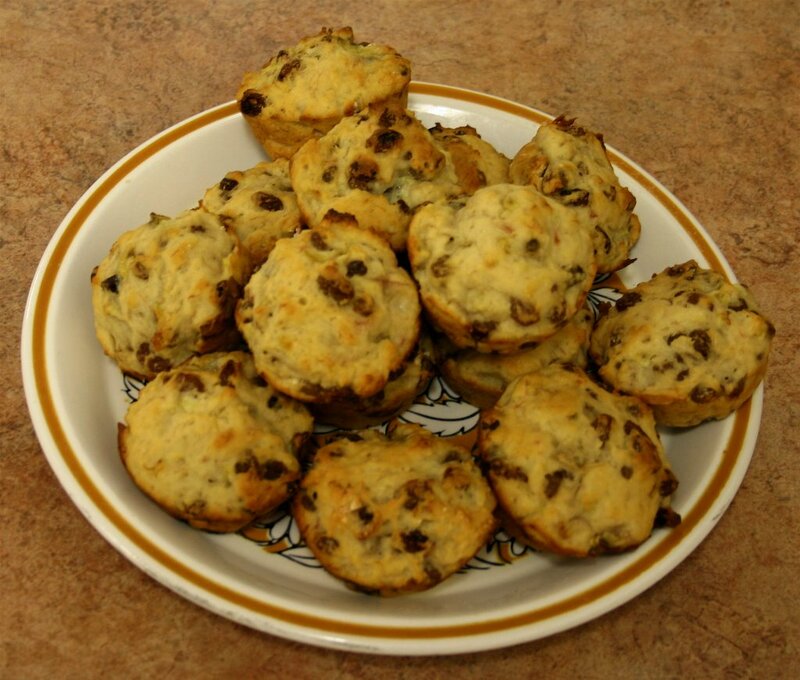 Note: No butter, sugar or salt is in this muffin, yet it still tastes yummy without any modern guilt trips. In fact, any mixture will probably be fine. 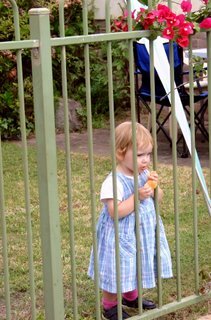 The latest Carnival of Homeschooling is up at the resource rich Homeschooling.about.com. Being Valentine's Day, the majority of posts deal with how many families celebrate the day. Our contribution is near the end under the sub heading Love of ... Controversy. I can do what Mum does too. I’m part of a crowd. Or I’ll get into fights. I want part of the fun. No, it’s not time for bed! These little crosses make me vexed. I’ve done lots of red. Rose does not want to be left out of anything the rest of the family is doing. As Clare was doing Cross stitch, Rose wanted to do it too. 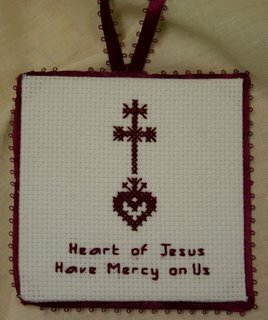 She also insisted that the pattern be placed "just so" under her hands in order for her to check the location of each cross. Update: Welcome to all our visitors from the 9th Homeschooling Carnival. Feel free to explore the site. Many of our posts are in the side bar. 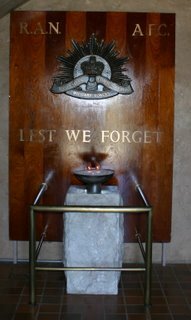 The Eternal Flame - Lest we forget.Key Words has pointed out a blog written by Carrie Luce called "Sense and Compassion - Looking at the issues without blinders". Carrie is very anti-homeschooling and anti-libertarian and Key Words was making the point that it is good she is blogging as she opens up topics that need to be debated. I had a good browse of her main page and pondered her point of view. There is no benefit arguing homeschooling with Miss Luce as the more fundamental differences are the real issue. 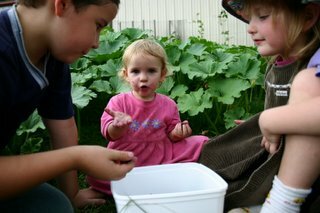 All the benefits we claim arising from homeschooling she metaphorically raises her hands in horror and cries, "Exactly! That's why it is so terrible!" We have a fundamental difference in core beliefs. Our basis for homeschooling, and in fact every facet of our lives, is how we view ourselves and our relations with the world around us. (I examined this previously in the post Family Roles) We need to ask the question, "Why are we here?" and "Why did God make us?" If one denies the existence of a soul and eternal life, the answers to our existence on Earth change dramatically. "know, love and serve God in this world and to be together with him forever in the next." Also, we believe that the family is the key institution in any society and the individual is best served growing within a loving, caring family. An individual raised in the security of a family can provide the best benefit to the society as the society exists to serve the family and not the other way round. That is our big difference. Miss Luce argues that society is the more important and families exist to serve society. Therefore all our arguments for homeschooling don't help, as all our positive points are her negatives. Unfortunately when one looks back at the history of the two competing viewpoints - family first vs society first - the score card is not good for those believing in Society First. Nazi Germany was a big fan of society/country first. The compulsory youth groups and government controls of schools and child care all did exactly what Miss Luce argues for. Germany had a strong national pride and cohesion of the individuals with little room for any individuality which may have threatened the social order. One may argue that the resulting war and expansion were not related to the society first concept so I won't claim that. However we will look at the situation in Germany before 1938/39. Germany improved from a mess economically following high inflation and joblessness into a lean, mean, organised machine under the changed social order. Unfortunately, this also resulted in the suppression of churches, organisations and relocation and imprisonment of individuals that wouldn't fit in and stay quiet. (This is before the War) Also, sterilisation and "termination" of the "unfit" and Eugenics were introduced and practised. These last steps are only the logical results of a society first program. Other recent famous examples of society/country first governments are those claiming to follow communism and socialism. You can choose Russia or China as the biggest examples, both had similar results. Surface level cohesion and co-operation with the underlying coercion, forced relocations, executions, sterilisations and wars (that supposedly could not be blamed on a society first policy). Oh, add in Zimbabwe, and every other tinpot dicator in Africa and South America. They also argued/argue for society first and for the individual to sacrifice themselves for the greater glory of the country and the riches tomorrow will bring. There is little point arguing about homeschooling unless you can come to some common ground as to why the individual exists. If Society exists for the individual and family, homeschooling makes sense and can be considered an option. If the individual exists for society and the country, then compulsory public schools are one of the better options to ensure the desired level of cohesion and uniformity. As to Treason, (Here is Miss Luce's post) we return to one's belief in the purpose of the individual. Treason is the betrayal of your country. To be guilty of Treason under law requires far more proof, but I suspect Miss Luce is using the looser definition. If you believe that anything outside the official guidelines is harming the country, then almost all of us (homeschooling or not) are guilty of this loose definition of treason. On the other hand, if you believe that the country is as strong as the collection of all it's members, then any actions which strengthen those members is actually patriotic. 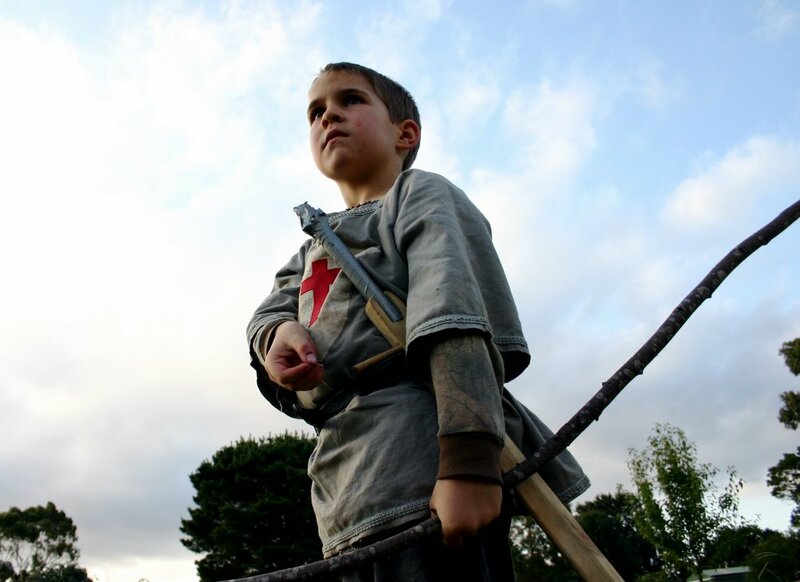 So, with the same facts at our disposal, homeschoolers consider themselves a most patriotic bunch, whilst Society First people consider us treasonous. This does not mean that those arguing for either side are saying society ONLY or family ONLY. Individuals and families have duties to others and the social order around them. Society always has some responsibility for the individuals within the society, but societies with disordered views of the purpose of an individual are more likely to vary their responsibility depending on the perceived value of the individual. An individual's value is either based on some measure - such as productivity, social standing, wealth, race, creed, colour and so on, or everyone is truly considered of equal value. To Miss Luce, an individual who is less productive because they are not specialising in a skill (excluding the raising of one's own children - that is deemed not useful) is of less value and therefore harms society. We believe Miss Luce is certainly of great value, just wrong in her views. It appears from her writings that homeschoolers, as traitors, have less value. 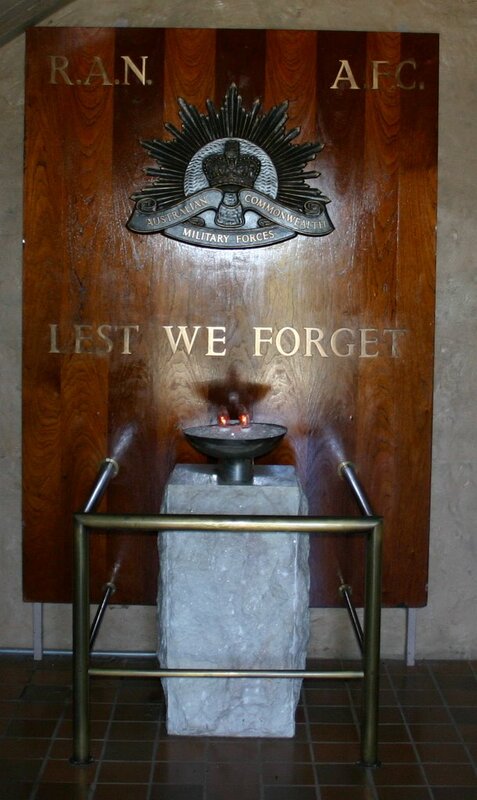 The photo accompanying this post is "The Eternal Flame" which is present at all Australian War Memorials. It is to remind us that eternal vigilance of all members of society is necessary for freedom to survive. Each name inscribed on the nearby wall is that of a real person, of inestimable value, who, realising the worth of their own life, risked and ultimately gave that life for his fellow men and women. Now that is really placing the individual and family first. He's a knight, brave and true. Peter enjoys being a knight. He makes his knight costumes from cardboard and duct tape or from clothes in the dress-up/costume box. But it's not just a costume that makes a knight. It takes imagination. Here he is posing for me, lining up his target whilst holding his bow. Note the stance, the steady gaze into the distance, and the hand holding his arrow, ready to draw and let go at a moment's notice. It reminds me of when we were children, ready to ignore the concerns of the world as we put our whole energy into the game. Have you seen a grid like this? It is from a logic game called Sudoku. The rules are simple. Every column and row and 9 square grid must have the digits 1 through 9. That's it. Using logic you fill in all the blanks. 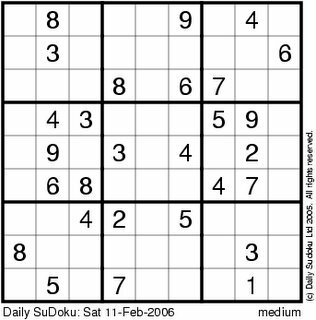 This puzzle is from The Daily SuDoku, one of many web sites dedicated to the game. Grids like this are appearing in newspapers and airline magazines next to the cross word puzzles. I brought home a a book of 100 puzzles for Lana and Ariel as a present from my recent trip to Brisbane. The lady I was working with told me of the game and mentioned that on one of her international trips she got hooked and had to throw her book away as it was too distracting! The Daily Soduko site even has an easier puzzle for children using a 4x4 grid. The outdoor pool will only be open Dec, Jan and Feb. Excess water usage is charged quite heavily. More information can be found here. Even the cinema didn't have the soda fountain/post mix drinks because it was too costly to use town water. "Where's the baby? 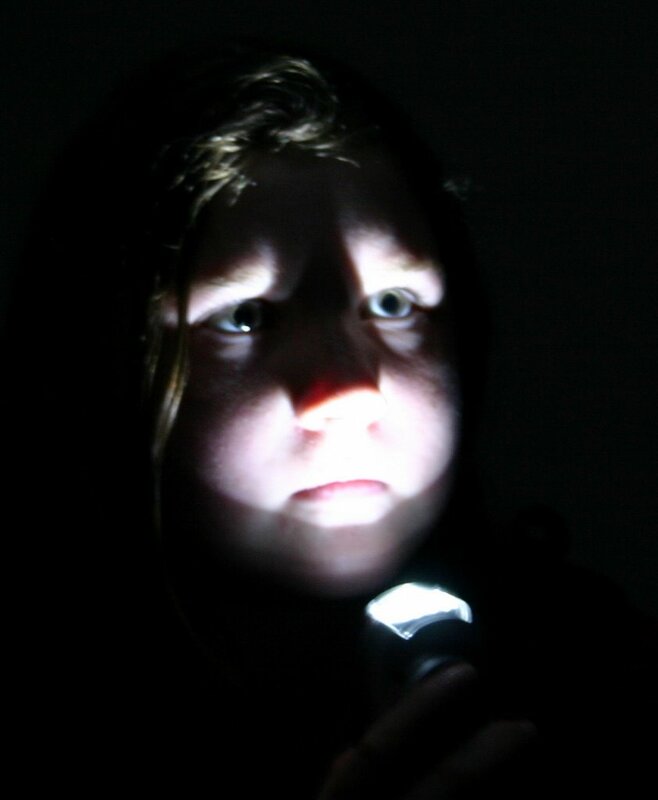 "James was awarded first prize for this photo of Rose in the Junior section (12 years and under), Portrait category. 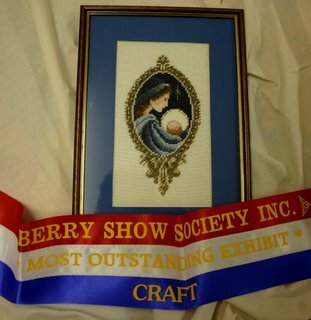 Peter won second prize for his outlaw cross stitch (same design as here, but with a nice border). He did a pretty good job considering he is only seven. 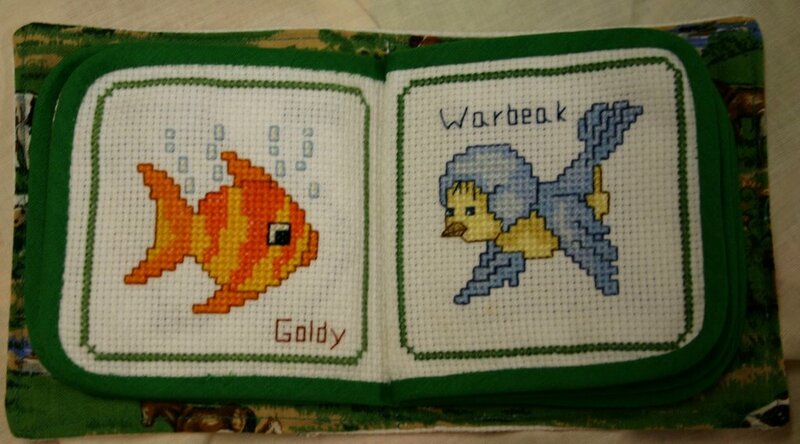 One of the inside pages Ariel won first place for this lovely little cross stitch book. 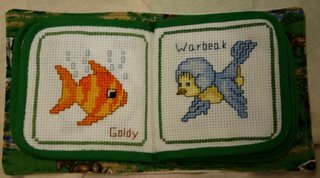 There are eight pages and a cover, all finished in cross stitch. This is a free design from EMS Designs, but you need to be on their message board. This is a free pattern from Lavender and Lace, "Christmas Madonna". There are quite a few free Christmas designs at the Told in a Garden website. 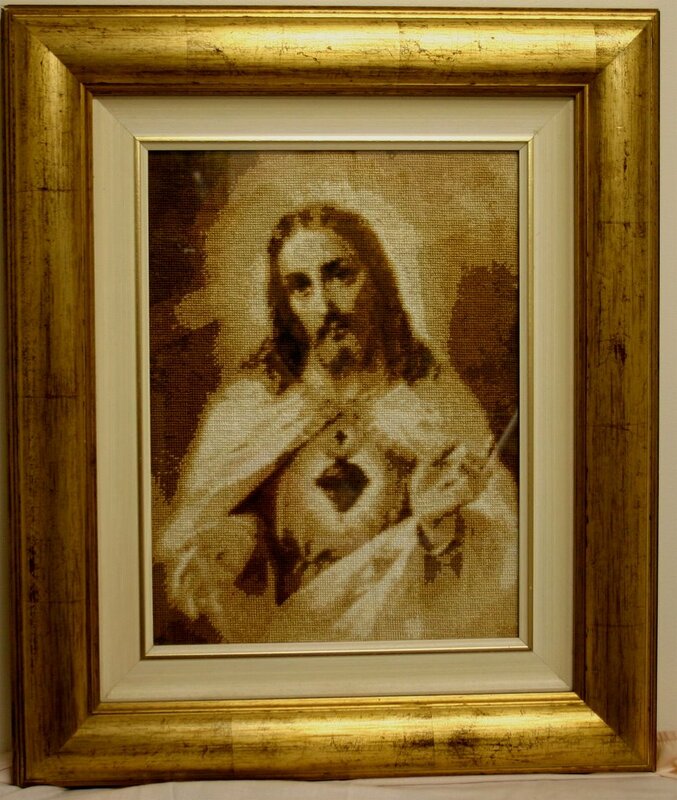 Sacred Heart of JesusThis design of the Sacred Heart of Jesus was awarded second place. 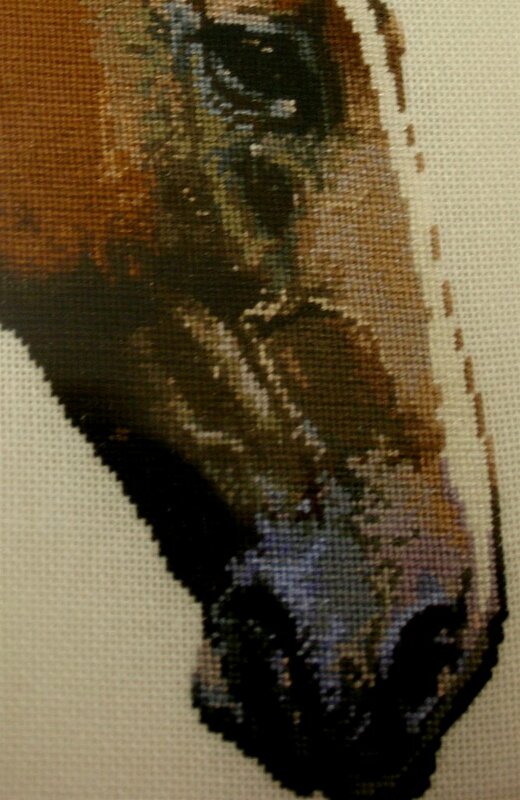 It is done in Continental stitch in a golden sepia tone. We had a picture scanned in by a fellow who created a chart for us to use. It took Lana quite a while to complete. As one stands further back from the picture it seems to be three dimensional. 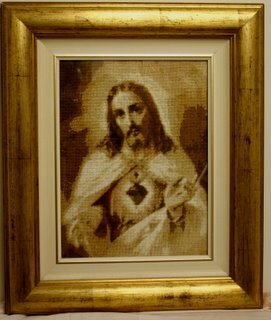 The matching Immaculate Heart of Mary is currently being framed. Ariel's fine workAriel entered this neat little cross stitch of the short "Heart of Jesus Have Mercy on us" prayer. She was awarded first prize in the junior section. 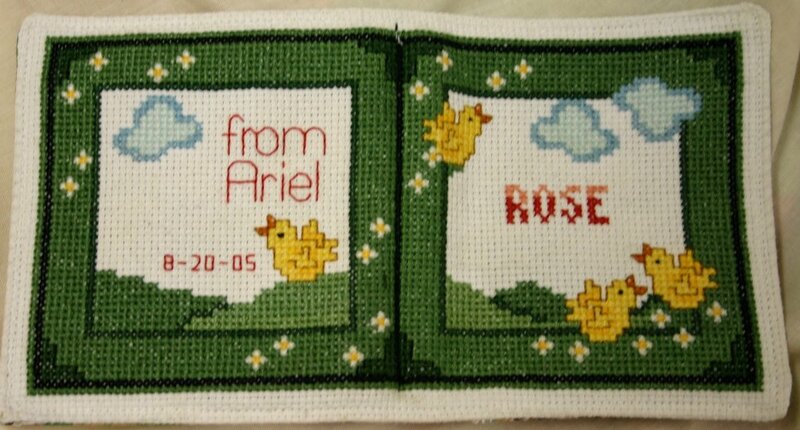 Although it is a small design, Ariel did some fine work and was well rewarded. Lana is most outstanding!As promised, here are some of the articles we entered into the Berry show. This tapestry category is "article in petit point". This means a picture stitched on very fine material. Lana finished the horse before we left for the US, and it looked like a horse Lana's family owned when she was a teenager. When we picked up our exhibits after the show there was a note from an admirer asking Lana to give him a call to either buy or commission another one of this work. Click for an even closer look I don't think he realises the cost it will be. If we calculate the hours times a reasonable hourly rate the value is quite a lot. Very few are willing to pay this much. The pattern is from the designer Graeme Ross. A Rose in a Tea GardenThis Rose is from the Tea Garden set by Lavender and Lace. This won second prize, meaning Lana scooped the competition. Why Homeschool has put up this week's Carnival of Homeschooling. They have cleverly organised the posts into the signs of homeschoolers. The wide range of posts cover areas as diverse as Socialisation (of course), problems with homeschoolers that aren't homeschooling, one looks at her 20 years homeschooling experience, others involve raising boys to manhood, reading, financial training, faith matters and even Valentine's day. What a diverse selection! We're under the scenic area for our Day in the Life post below. Lana's dad has had to quickly leave us. The local fire brigade is joining with many other volunteer fire fighter units around New South Wales to fight large bush fires near Wagga Wagga NSW. We don't know how long he will be away. The Christmas before we went to the US there were very severe bushfires near here and dad had to leave just after Christmas lunch and we hardly saw him for the next two weeks other than to return home covered in soot and sweat for a clean and sleep and then off again. Our local unit worked close to 12 to 15 hour shifts almost every day in that time. And this is all volunteer effort. The local volunteer fire brigade meets every Wednesday evening for training and often has weekends away as they learn new and refresh old methods. Sometimes it seems as if all they do is fund raising. The local shire (county) provides the fire engine, but donations provides all the rest. This includes radios, uniforms, protective gear, the lot! After a late night on Saturday, we had to wake early to get to Mass before visiting friends in Sydney (2 hours away). It was worth the trip. With the four families there were 24 children and eight adults. I want to swim in the big pool too.As it was a warm day, quite a few of the children were in the pool, others were inside playing various games, the adults were chatting on all the forbidden topics of politics, religion and sport. Ariel and the other older girls had a reading competition. They found some good books they had not yet read and each wanted to see who could read the fastest. The game ended without a result, but Ariel was upset when we announced it was time to go. "But I only have a chapter left!" Luckily for her I had to delay our departure as I sorted out some Windows and computer issues. We really enjoy these type of days when we get together with other families. All members of each family get to recharge their batteries and socialise with others their age. If you can't find another child of your age and interest in 24 children you would have to be pretty unlucky. 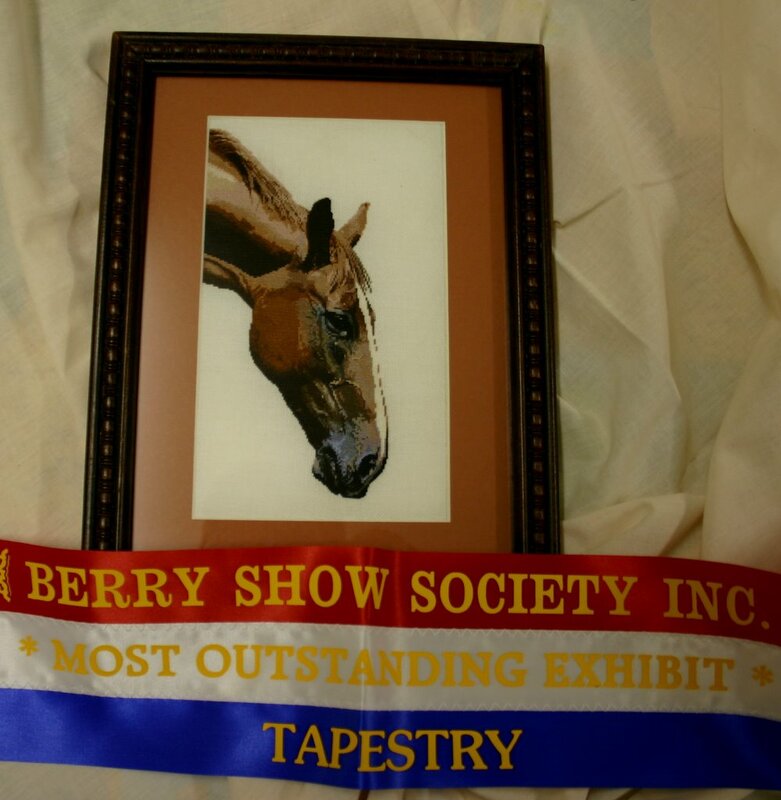 On Saturday we visited the Berry Agricultural Show. To paraphrase the movie, "Charlotte's Web", "It was the best town show in the town!" Lana's parents and us all piled into the Wombus (the name we decided for our 12 seater van - a cross between a wombat and a bus) and travelled 1.5 hrs over the mountains to Berry. 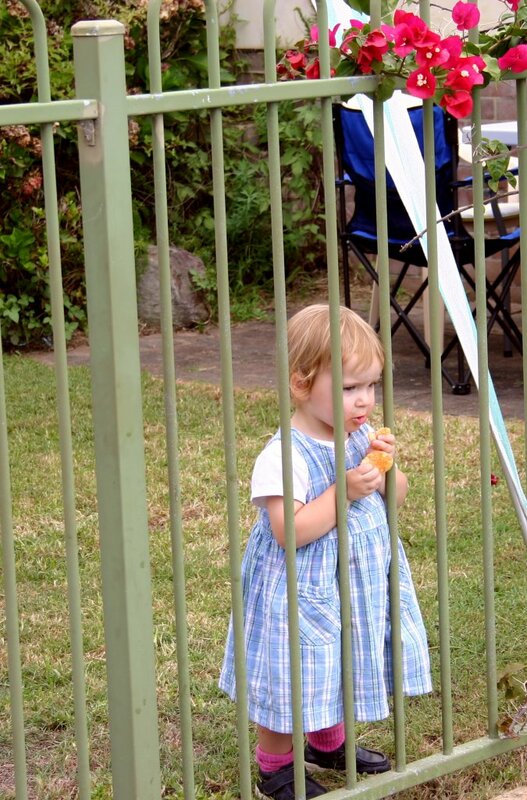 Lana, her mum and the children had entered various items in the pavilion exhibitions, as we had for the Bowral show. Lana, Ariel and Lana's mum did very well, and James and Peter also won prizes. I'll show off their exhibits in the next day or so. Other than the pavilion which showed arts and crafts, flowers and plants, huge pumpkins and photography, there were horse and livestock judging and entertainment. 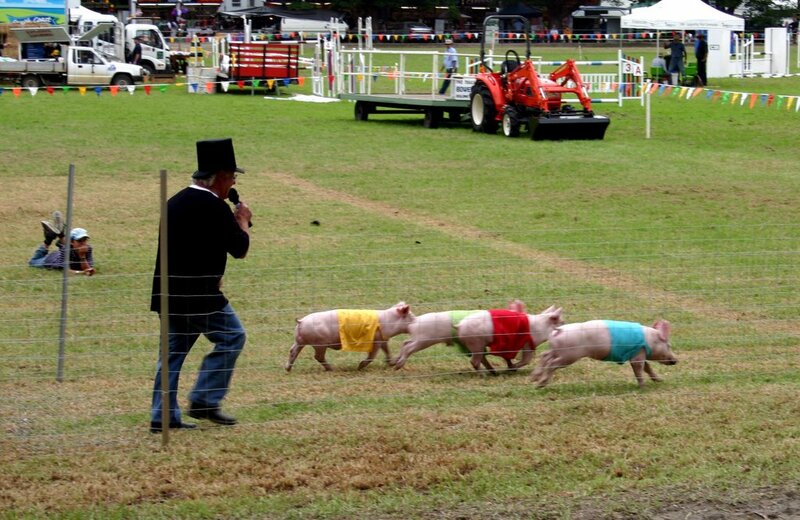 They even had some pig racing. 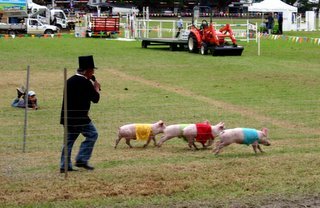 The fellow with the tall hat put on a good show getting the crowd to cheer on the four pigs in coloured tops, racing to get back in the float trailer. Fire safety for the children. "Can we go again?" 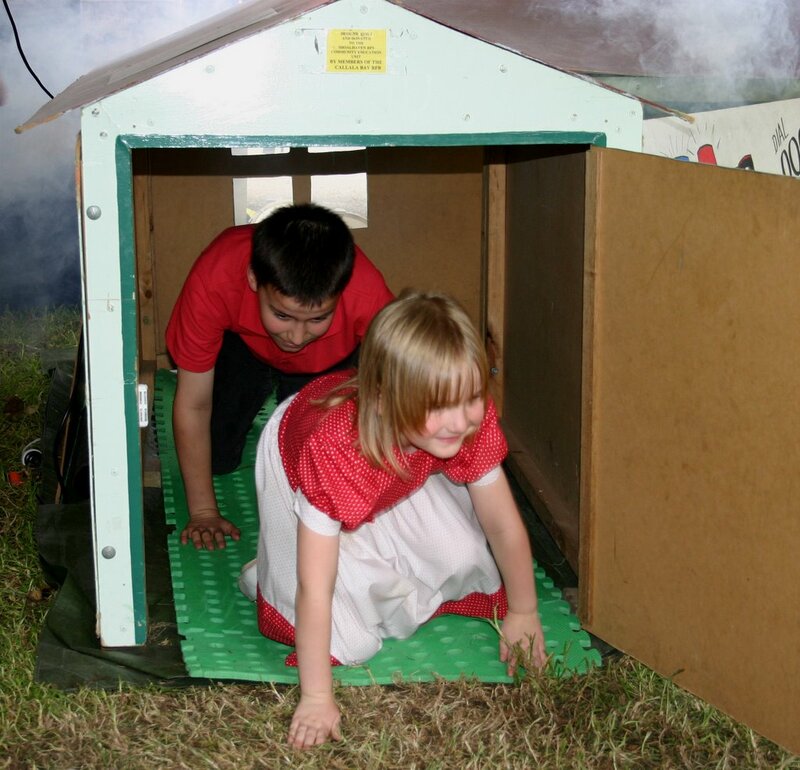 The Fire Brigade is always at these things, getting across the message of fire safety and bush fire prevention. We asked the men to show us how to correctly use a fire blanket and they also showed the children what to do if they caught on fire. Stop, Drop, Cover and Roll. Stop what you are doing, Drop to the ground, Cover your face and nose and Roll to smother the flames. They also had a little house which they filled with smoke and had the children crawl through so they could remember that in case of smoke, stay low and crawl. Rose went through several times, running as it was exactly her right height. Real men wear white. And sweat a lot. We spent quite some time watching the Wood Cutting competitions. 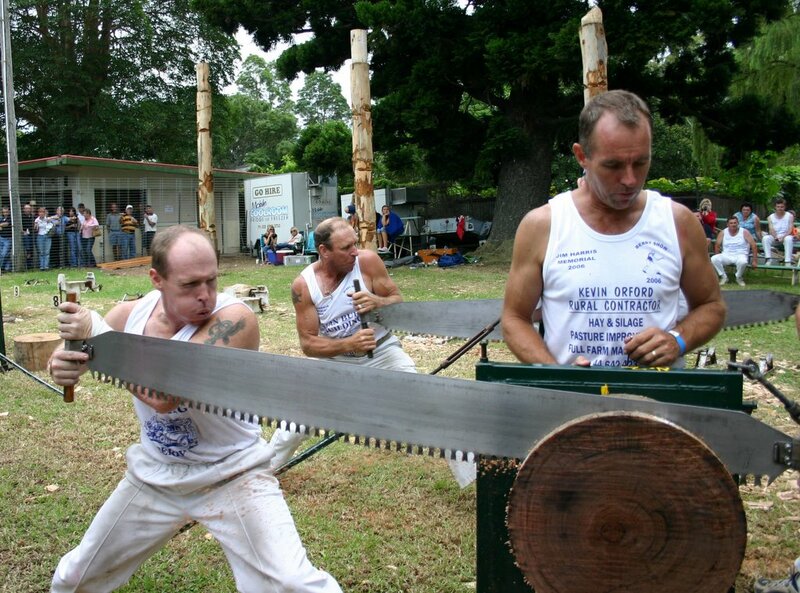 This group of guys were amazing to watch as they chopped and sawed through a variety of logs in very quick time. In one of the competitions, the handicap was counted in strokes. At One, the first guy started, and as each man's handicap was counted he started chopping. At 52 seconds (!) the last guy began and he just finished second by about two chops. It only took him about four huge swings of his axe to finish one side and start the next. The competition was very sportsmanlike. In this photo you can see the fellow exerting himself in the two man saw with the fellow in the middle - his opponent - urging him on to go faster! We spent a long day finally returning home around midnight. We have often been asked, "So, what do you do at home all day?" as a way of trying to work out how we teach the children and survive all day together. Firstly, our aim is to share our night time meal together. As I tend to work at clients up to two or three hours away, dinner time is often around 7:00 to 7:30pm. Accordingly we have settled into a routine of 9:00pm bed times for all. This means we don't get up at the crack of dawn. We start the day with breakfast and cleaning rooms. Then all the children gather at the table and do the morning's maths quiz. This takes about 15 minutes. All then do their own maths. Lana sits at the table on hand to assist in any questions they have. We use Saxon Maths which is a good design for homeschoolers. Near every question has a number in brackets which links back to the relevant lesson. That way if you don't know how the problem is solved, you can quickly find the relevant lesson to reacquaint yourself with the right technique. Lana goes through the maths lessons with Peter and James whilst the older ones are mostly self directed. Reading/English/History is the next lesson. The younger children read to Lana and the older children go to their assigned books. Currently Ariel (Year 9) is reading Shakespeare, Martyrs of the Coliseum and Christ the King Lord of History. Eric (Year 7) is reading The Longest Day by Christopher Ryan and Christ and the Americas and McGuffey's Readers . James and Peter are reading McGuffey's readers, English for Young Catholics and readers from the Faith and Freedom series of books, both from Seton Homeschool. Then the older children work on other subjects for science and so on. 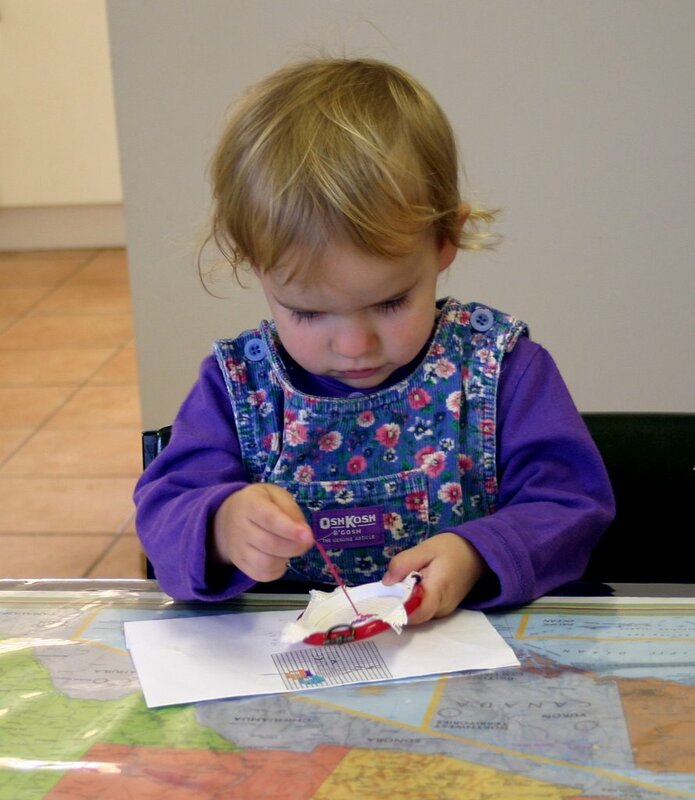 While all this is going on, the little ones have some paper and colour-in or do crafts. Clare (4) enjoys doing her "schoolwork" - some alphabet related activities. 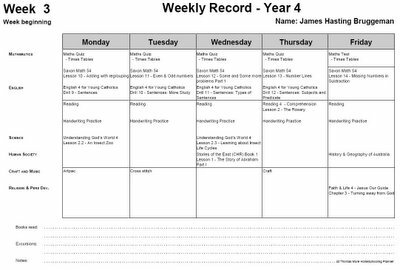 A week in the school life of James (Click for a closer look)I have created a weekly planner to make our preparation and tracking so much easier. We enter in the details for each book the child will be using and link them to a subject for each child. 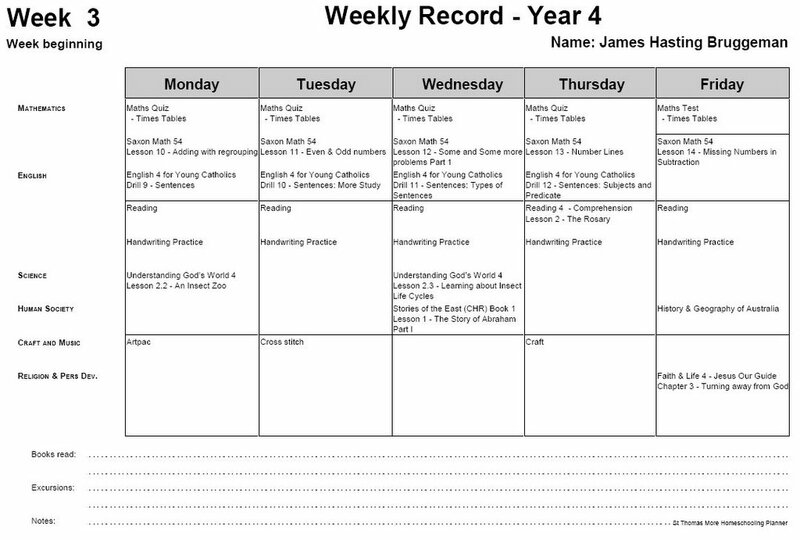 We then decide how much is needed to complete the book for the year (divide by 32 or 40 weeks) and then set up each week so the work is spread out. Each child then has their year's plan in a display folder. As they finish each bit they can colour in the box or tick/check the area. If they are ahead or behind in a subject, as we know where we are at, this can be addressed without panic. I created this in Filemaker Pro so that once a subject or book is entered, it can be easily copied to another student. Lana was able to prepare this year's curriculum for four children in an evening. The first time to setup takes a little longer as you input the original data. If the children do their work without too much mucking around they are done by lunch time and have a free afternoon. And there is no homework. This "schedule" is pretty flexible, and we have built in slack for events that happen such as accidents, sickness, travel, babies, building a house, living in another country, bush fires, hurricanes and so on. Tonight we watched another Shakespeare play, The Comedy of Errors. James (9) was alternately laughing and squirming as Antipholus and Dromio mistook each other and confused the local populace. The story centers around a dual set of identical twins, which were seperated in a storm, each with one parent. Not knowing which child was which, both the mother and father named their children the same. They arrive in Syracusa and so begins a comedy of errors. We are finding that once a play is watched with subtitles, we all gain enjoyment and the eldest (14) is spurred on to read another play. It's a blooming Pineapple Flower! 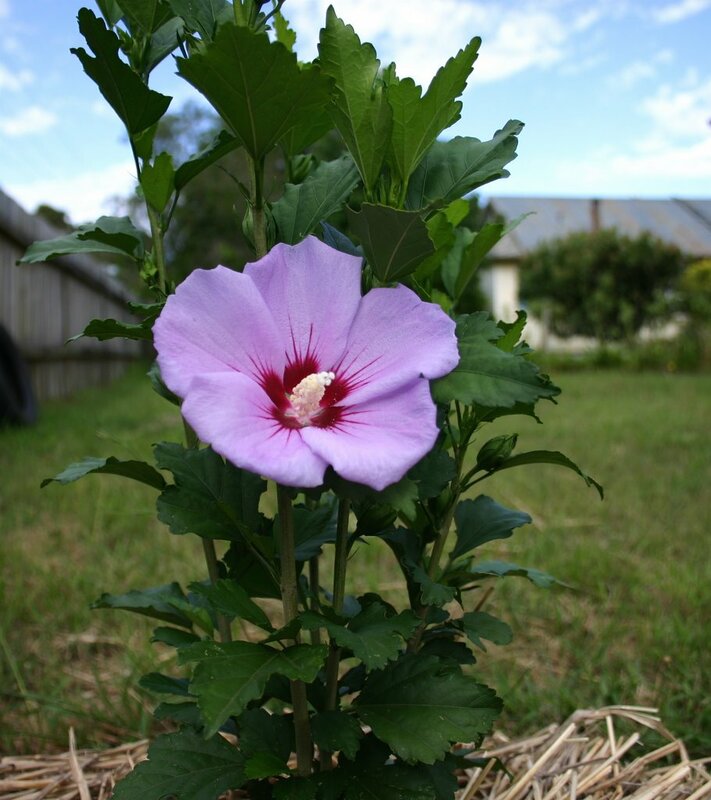 Lana's parents are slowly transforming our barren land to a growing, living place. 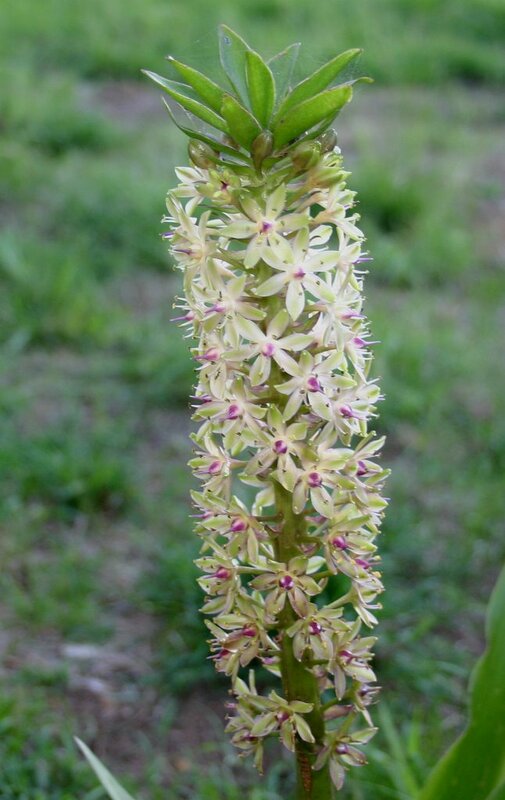 One of the lovely plants that is enjoying our place is this Pineapple Flower, also known as Eucomis. It starts by looking a lot like a skinny pineapple then each bud bursts into a flower from the bottom upwards until the whole thing is surrounded by these lovely little blooms. We weren't sure if it would like it in our location as all the books suggest it prefers a sub-tropical environment which we certainly aren't. We'll just see how it survives Winter. For the moment we can just enjoy the beauty.